Earlier this year, we looked at the two-day convention in Seneca Falls, New York in 1848. (If you missed those posts, click here and here.) Less well known is the first National Women's Rights Convention held in Worcester, Massachusetts in 1850. Many of the prominent organizers and speakers at the first convention--including Elizabeth Cady Stanton and Lucretia Mott--were still active in the 1869 gathering. Over nearly two decades, the issues remained the same: equal wages, access to education, access to work and careers, property rights, marriage rights, and, always, voting rights. 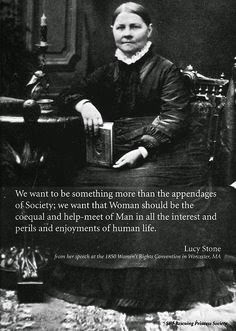 Susan B. Anthony would later say that it was reading the text of the speech given by Lucy Stone that drew her to the suffrage movement. Speakers included the abolitionist and suffragist William Lloyd Garrison, Sojourner Truth, and Frederick Douglass. (You can see the entire program and read the speeches by clicking here.) 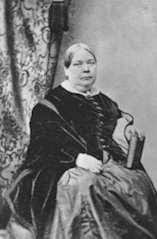 Interestingly, however, while one of the major themes of this first convention was opening the medical profession to women, physician Elizabeth Blackwell, who, she says, has "read through all the proceedings carefully," expresses deep reservations--"I feel a little perplexed by the main object of the Convention--Woman's Rights." 7. To abolish the gallows. What struck me about this list, so fearful of women's "designs," is how closely it resembles Pat Robertson's view of feminism, from a 1992 fundraising letter (he was running for President). The "feminist agenda," he claimed, was not about equal rights: "it is about a socialist, anti-family political movement that encourages women to leave their husbands, kill their children, practice witchcraft, destroy capitalism and become lesbians." Those women! Always wanting stuff, like equal rights.